What to do with the floor after it is clean? | ¿Qué hacer con el suelo después de que esté limpio? 1-Quart covers about 30 square feet. 1-Gallon covers about 125 square feet. 5-Gallons covers about 625 square feet. 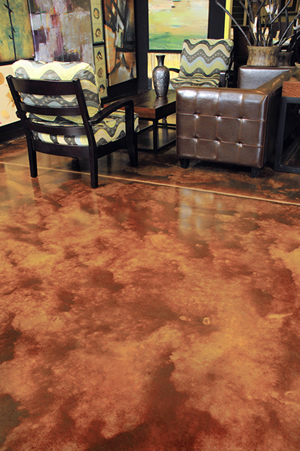 SCR1600 performs better when the floor temperature is between 65 and 90 degrees Fahrenheit. Temperatures below 65 degrees will slow down the effectiveness of the product. Allowing SCR1600 to dwell longer on the surface will remove more material. At SealGreen™, we love this product and use it extensively in the service side of our business in the KC Metro area. Let the SCR1600 sit. The rule we use is "the tougher the coating, the longer we let it sit." For most uses it is good to let it sit for 8 or 12 hours but for two-part coatings, like epoxies, it can take up to 24 hours. SCR1600 es una mejor manera de eliminar pinturas, uretanos, acrílicos, resinas epoxi, esmaltes, selladores no penetrantes de hormigón o madera sin el desafío de lijar o raspar. Recomendamos probar el producto antes de comprar grandes cantidades. La cobertura es aproximada, dependiendo en la porosidad del concreto y material removido. 1-cuarto de galón cubre aproximadamente 30 pies cuadrados. 1-galón cubre aproximadamente 125 pies cuadrados. 5-galones abarcan aproximadamente 625 pies cuadrados. SCR1600 funciona mejor cuando la temperatura del suelo es de entre 65 y 90 grados Fahrenheit. Las temperaturas inferiores de 65 grados reducen la eficacia del producto hacen que el producto trabaje más lento. Deje que el SCR1600 se siente en la superficie por lo menos 12 horas para eliminará más material. No deje que se seque. Aplique una capa gruesa de SCR1600. Es muy importante aplicar una capa uniforme de espesor, ya que esto ayuda al SCR600 a penetrar y quitar la pintura. La aplicación de una capa fina puede reducir la potencia de trabajo. Deje reposar SCR1600. La regla que utilizamos es "la más dura o gruesa sea la pintura, hay que dejar que repose más." Para la mayoría es mejor dejar que repose durante 8 o 12 horas, pero cuando hay dos recubrimientos de piezas, como las resinas epoxi, puede tardar hasta 24 horas. SCR1600 Coatings Remover funciona mejor cuando la temperatura del suelo es de entre 65 y 90 grados Fahrenheit. Las temperaturas inferiores a 65 grados se adelanta la eficacia del producto. I had to return the product, and I follow their rules on how to do that however they never send my money back. their reason was that the product was damage but I never open the box I return it on the same box that they sent it. I ask them to call me and they never did, I try calling and they don't answer. Yes, you did follow all the return instructions but unfortunately, the package got damaged by the carrier as it was returned. Our Return Policy does require that the return product arrive in resalable condition in order to be accepted. The pail was leaking inside and outside the box. UPS will not accept any boxes that are leaking so it was damaged in transit by the carrier. You may want to file a claim with UPS for damaged product. This didn't work as well as I thougtht it would. I had a cement front door landing that the previous owner had painted over at least 2x. We had tried a few other products before ordering this. I thought it'd be a silver bullet, but it wasn't. We applied the product very liberally and placed plastic over it to keep it extra wet. After 24hrs, we went to remove the product and it had taken off the top layer and most of the 2nd layer of paint, but it was not easy. Certainly, not like it is shown in the video. In the areas where it did take off the 2nd layer, there apparently was some type of adhesive on the front landing. We ended up going out to Lowes/HD to purchase regular stripping product to take the rest of the 2nd layer and some of the adhesive off. I thought the product would eat through all the layers, but when I spoke with customer service, they told me that I should have purchased additional amounts for the different layers and applied the product multiple times. For the cost v. reward, I would not recommend it. Worked as advertised. Removed two layers of carpet glue. I am sorry I ever purchased and never more disappointed. We always recommend to do a small test to see if it will work with your coating. We do not make any claims that the product will remove all coatings. Doesn't work !! Doesn't work on epoxy floors! We always recommend to do a small testing before full application. Product does not work as claimed. We always recommend a small test before full application. Product works great, just as advertised. The product works great and the customer service is number 1.